Water features are important components of modern swimming pools. They are an added aesthetic benefit that can transform your pool to the next level. A pool embellished with a water feature provides more opportunities for activities and entertainment as well as personal satisfaction. Why should you add Water Features? Water features have two purposes: to enhance the visual appeal of a swimming pool and to add functionality. Artistically designed water features like fountains and waterfalls can vividly transform a pool into a work of art. Features like a spa and slides add a wide range of functionality to the pool. If you want to transform your pool into a place of beauty, a hub of activity and be the envy of your friends and neighbors, then water features are a must. Water features come in a wide variety of types, designs, and configurations. Some of the most popular features include fountains, waterfalls, cascades, slides and spa spillovers. There is no limit to the varieties and designs available. Imagine anything, and we will create it for you. Waterfalls: Waterfalls add elegance, movement, sound, and life to the still water of the pool while creating an environment so tranquil and soothing that one can sit down next to the pool all day and never get tired. When designing waterfalls, the only limit is your imagination. Fountains: Like waterfalls, fountains add movement, sound, life, and elegance to the pool while giving the entire area a tranquil and elegant atmosphere. Fountains are popular features of pools because they are comforting and reassuring. Cascades: The Cascades are mini-waterfalls. Not only do they add beauty to the pool, they also give unlimited fun and pleasure to children and as well as adults who like to play with the crystal clear water cascading lazily into the pool. Slides: If you have kids, then you must have slides in your pool. They guarantee unlimited fun and pleasure all year round to both children and adults. From long to short, high to low, straight to curved, plain to stylish, slides come in hundreds of attractive designs and styles. Water curtains: Water falling into the pool from an overhanging structure in the shape of a curtain creates a visually stunning picture of your pool. On a hot summer’s day, it also serves as a cooler to chill the warm air. Infinity Pool: One of the most dramatic trends in swimming pool design, an infinity pool, gives one the impression of a continuous body of water. You do not have to live by the sea to envision this. We can create this for you in your own backyard in the Northeast as well. Spa Spillover: Are you into healthy living and massages, if so then this is perfect for you. 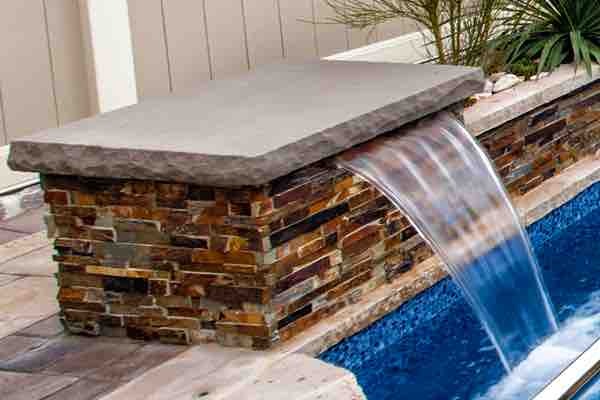 We can build a spa next to your pool and have the water spill over into the pool in the form of a waterfall or cascade. This is incredibly relaxing and is an excellent therapeutic experience. Are you ready to add cool water features to your pool, give us a call at 718-984-POOL and together we can give your pool the look you desire.